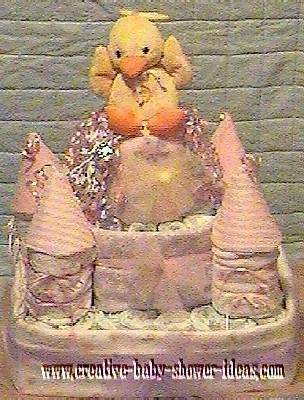 Welcome to the princess diaper cake section of our gallery. 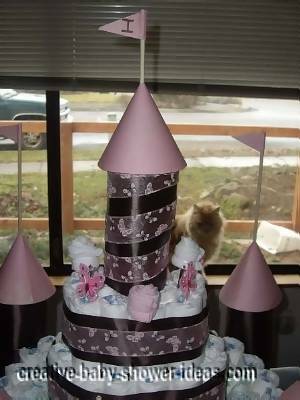 In this section, you will find pictures of cakes fit for a little princess! NOTE: All of the pictures and how to tips in our gallery have been graciously provided by our website readers. 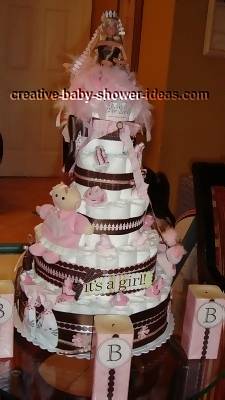 Instructions for making your own diaper cake is provided on the index page. 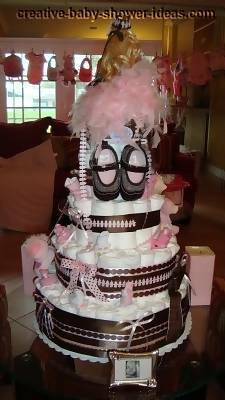 This cake has about 25-35 diapers in it. 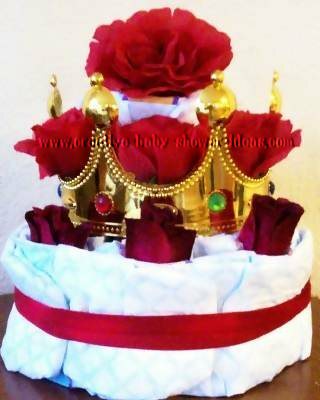 One Gold Crown dressed with silk red roses. I like this one because you can change up the color if it's a boy or a girl because the crown has different colored jewels. I made this for my cousin's shower. 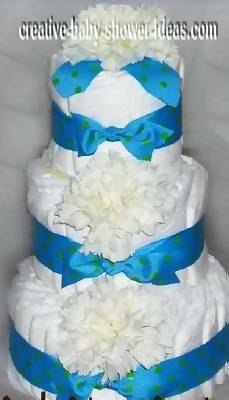 I used 132 Pampers Swaddlers in size 1 to make this diaper cake. 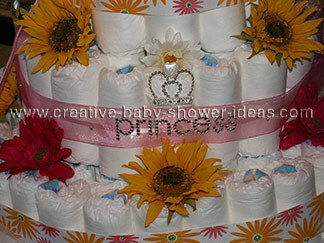 I started by rolling the diapers in a "jellyroll" fashion and secured them around the center with a rubber band. I then cut 3 different sized circular tiers out of cardboard. I glued the lace trim around the edge of each tier by hand. 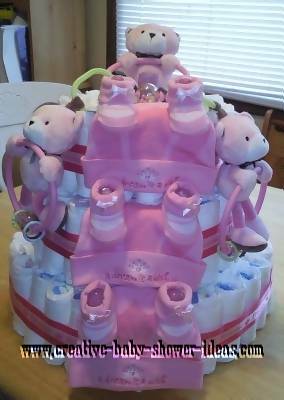 I laid a burp cloth on the bottom tier and then added the diapers in a circle until full. I secured the diapers together with another rubber band. I folded the burp cloth up and over and then started my next tier. I completed these steps again for the next 2 tiers. On the top I placed the teddy bear and pinned her in place using straight pens. 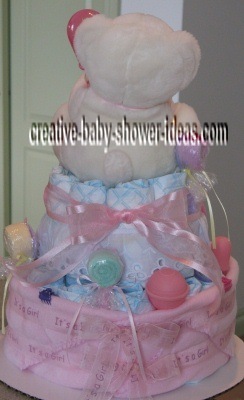 I then added all the travel size baby bath items and attached the pacifier holder to the top tier. To cover the rubber band I added wide satin ribbon and wrapped it around each tier in the center. I secured it in the back with pink mini clothespins. I put the small silk roses in between the diapers in various spots with floral wire. 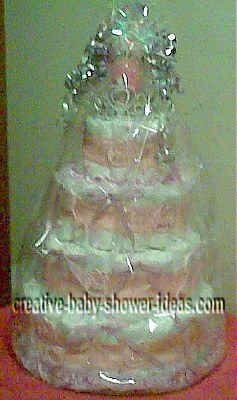 I attached pink "It's A Girl" ribbon at the top and weaved it in between the satin ribbon down each side of the cake. Finally I secured everything together with straight pens and VOILA!! 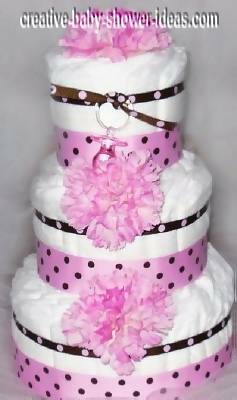 You have a Pretty In Pink diaper cake fit for a little princess! 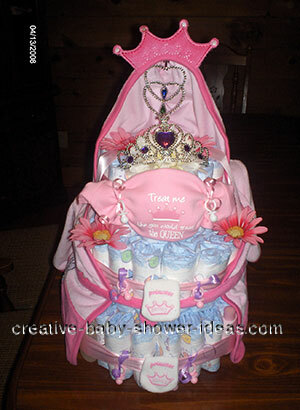 This fairy tale princess diaper cake was made with 100 Premium Diapers ~ Size 1, a fleece blanket 30" x 30", an embroidered waterproof bib that says, "Grandma Loves Me", and a fairy tale photo frame ~ Fits 2 x 2 photo. 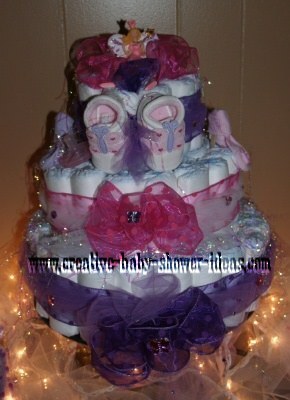 This is the first ever diaper cake that my best friend and I did. 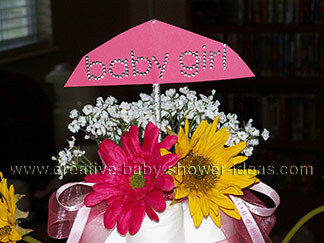 It was for my sister's baby shower and we thought we would share it with those that are thinking of making one. 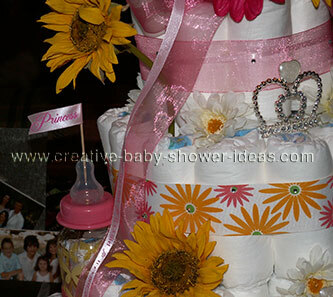 These diapers are rolled and then decorated with princess baby girl accessories. 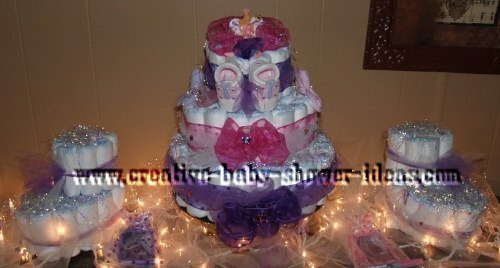 This is a princess diaper cake that I made for a friend. Hope the people enjoy it. 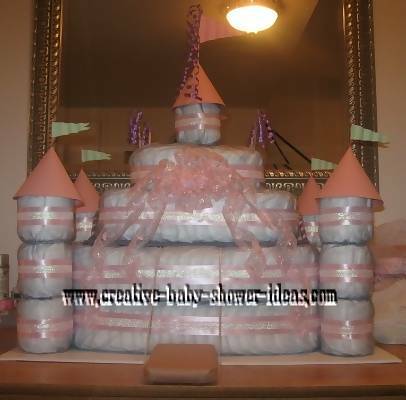 3) Each item Baby oil, powder, shampoo use a different princess ribbon measure around each, cut leaving enough to glue with hot glue gun to the ribbon wrapped around the tier. 4) Using the mini cloth pins attach scratch mitts and socks to top tier. 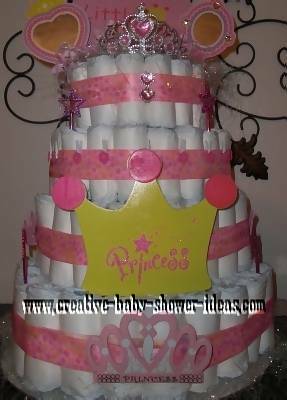 5) Between cake and foam tiara there is enough room to place items such as the baby lotions. 1) Take (2) pink wash cloth, fold it so that it no wider than 1"
2) Take 2 cotton balls place at the end of one wash cloth and roll. 3) Take the rolled wash cloth and roll it again in the second folded wash cloth. 4) Hold on to it, take spoon, hold spoon behind roll, take small elastics (6) and secure wash cloth to spoon. 5) Cut a triangle out of pink transparent paper. 6) Place washcloths down(spoon back facing up at you) wrap paper around the bottom of the washcloth roll. I first rolled all the size 2 diapers and secured them with rubber bands. Then I took a rectangle box and secured it to the middle of my blue painted cardboard (a castle must have a moat..Lol). I then started to place diapers and wrap them around the box until I got my shape. I then secured it with a large rubber band. I made the 2 bottom rows the same size and then added the three top layers later (which are removable). The 3 top layers including the tower on top are all attached to the lid of the box so it could be removed as one piece to reveal all the goodies inside. The only diapers on this that cannot be used are the bottom three of each tower attached to the blue cardboard. They are hot glued for security measures. 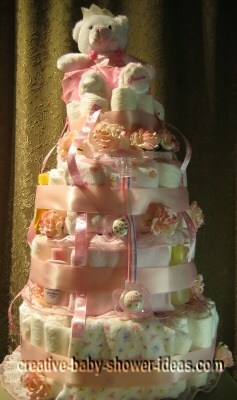 The towers are made up of three levels of 3 diapers wrapped around a dowel, then wrapped with brown ribbon. I then took paper I got from a scrapbook store (which took me an hour to decide on :0) ) to make the tower roofs. I made the flags out of the same paper. I had the diaper wipes container made to order along with the butterflies. I added "sock" flowers for decoration and they are attached to baby spoons for security. 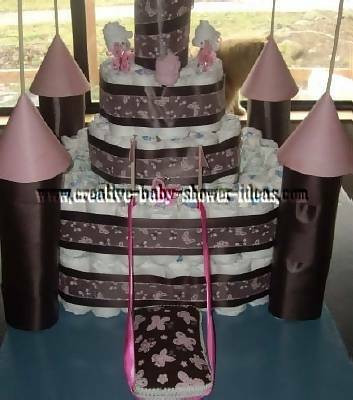 Here is my last minute princess diaper cake. 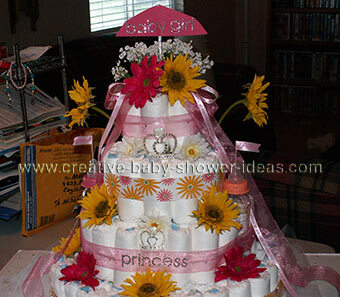 The two top tiers were size 1 diapers and the two bottom tiers are size 5. I went to the Dollar Tree and got the entire the princess decor, wands, tiara, princess heart. I got the ribbon from Michaels and the little mini clothes pins from Michaels as well. I used translucent filler at the top and bottom of the cake. 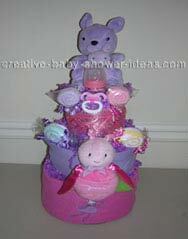 My 2nd diaper cake. This castle was for a boy. There is a box as in the first layer that is filled full of baby supplies that the parents will need for baby. I used wooden dowels for the towers surrounding the castle. Approx 220 diapers. My name is Dee from Port Richey, FL.. 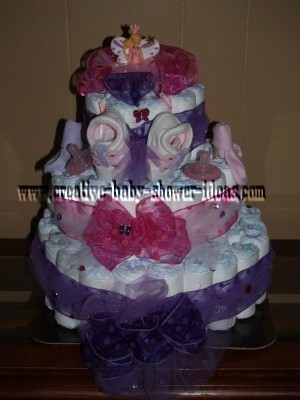 I make diaper cakes on the side as a small business. I came up with this for my cousin who is having triplet girls. 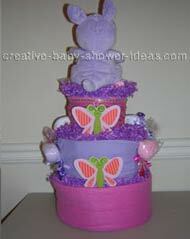 First I took diapers and wrapped them around a large box to make the base. ( I did not roll any of the diapers because I feel that it makes the diapers harder to use in the long run) I then wrapped diapers around an empty shoe box for the next tier, and then wrapped them around a wipe container for the tier on top of that. 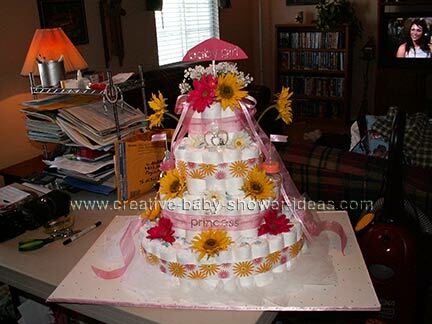 The top tier is just a roll of diapers. 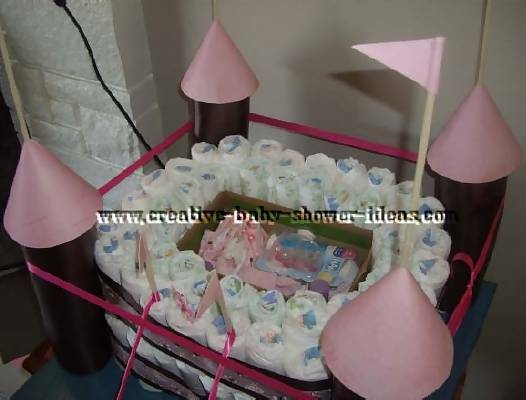 The 4 towers each consist of 3 levels of rolled diapers supported by a dowel rod. The roof I made out of a thick pink craft paper. 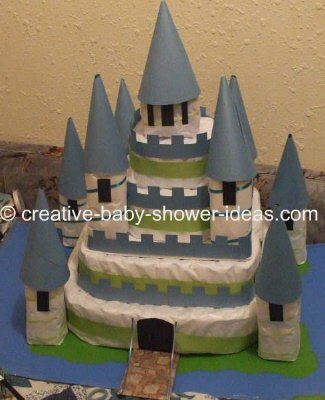 After all the diapers were wrapped I wrapped each level of diapers in grey tool to give it the color of a stone castle. I then wrapped each row with ribbon. I hand crafted the center bow with wired pink sheer ribbon. The top 3 tiers of the tower are all secured together and are attached to a lid for the box I used to make the base. I made handles for the lid so that it would be easy to remove. 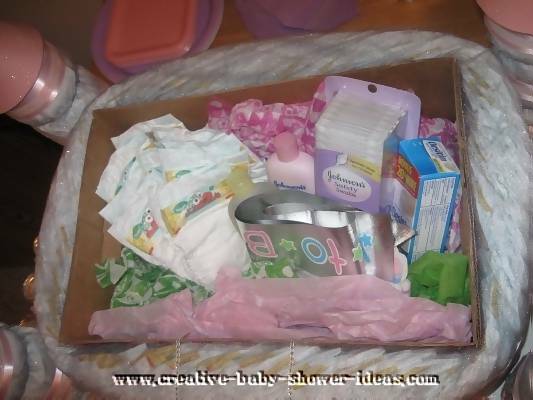 In the base box I placed other gifts for the mommy to be, such as lotion, baby wash, extra diapers etc. For the display table I placed poly fiber fill on top of the table and placed white lights all around...I then topped the lights and poly fill with a large piece of white tool, giving it the illusion that the castle was in the clouds. I then arranged the candle favors that I made all around the table for people to take as they left. 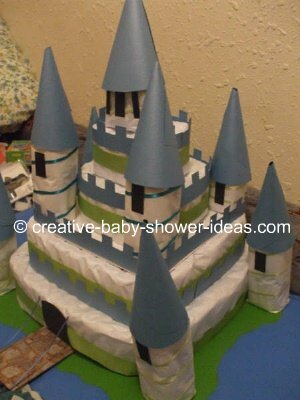 This castle was a huge hit and was so much fun to make!! 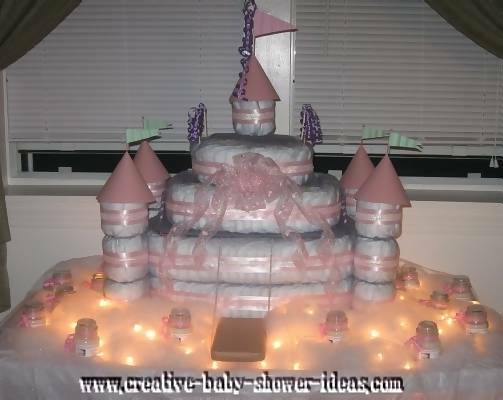 This is a picture of my diaper cake castle!